In my house we have been Boston Market Fans for over 15 years! My husband introduced me to the restaurant. Prior to that I had never heard of the place. We have many great memories of eating their food. Some of our first few dates we would get food from there and go to the river or park to have a picnic. I love their Chicken Tortilla Soup, its addictive its so good. All these years later we are still eating there. The first Thanksgiving my son was born he was only a little over a week old and there was no way I was going to cook a Thanksgiving dinner. We ordered a Boston Market Holiday Meal that year and oh my was it good! Their Pecan Pie is delicious. All the traditional items were included the meal. The following year for Thanksgiving we made all the tradition items at home but when it was time to eat my turkey was not cooked all the way and its was getting late! I was so upset that I messed up the most important part of the dinner. I was trying to go all out making it special for my son. Thankfully I remembered Boston Market was open late that day and I drove as fast as I could (of course within the speed limit lol I so did not want a ticket on top of a under cooked turkey!) When got there they was only 20 minutes until closing and I got all the Turkey I needed. Plus it was already sliced and came with gravy! That year Boston Market saved Thanksgiving from being a side dish only dinner. This year I decided I want to enjoy Thanksgiving of watching the parade, playing with my son and just relaxing. I did not want to stress over cooking or under cooking in my case and the huge clean up involved with the Turkey Dinner. We did not know exactly what we would order from Boston Market this year. We did not know how many people were coming over or if everyone would be going to another family members home. It ended up being only 4 of us and we purchased a Turkey Dinner Family Meal from Boston Market. It was perfect for us. Just enough to have a great Thanksgiving Meal. My mother in law brought over a few side dishes and some home made turkey she made. The funny part was her turkey remained untouched and her sides got cold! We all agreed the Boston Market food was way better than the food she made. She commented next year she will bring MORE Boston Market to add to ours. One of my favorite items from Boston Market is the Creamed Spinach. Its amazing! No matter how many times I try to duplicate it or try it made from someone else its never the same. Their Turkey is soooo good. Its cooked perfectly and fork cutting soft. The corn bread is a classic item from there and in the shape of little mini loafs, too cute! The Corn bread went so fast there was only a few left when I had a chance to take a picture! This year for the December Holidays you and your family should try Boston Market Family Meals as an option for a stress free holiday dinner. 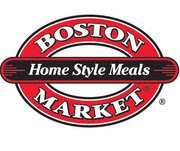 Boston Market is also great as a day after or before meal for family and friends gathered at your home so you can have a simple solution to feeding everyone quality food that taste great! 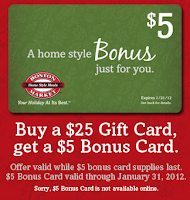 At Boston Market Restaurants you can get a $5 Gift Card for purchasing a $25 Gift Card from now until Jan. 31, 2012. The offer is not available for online purchases. 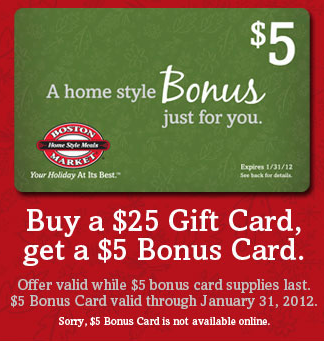 You can learn more about Boston Market and when they have sales and coupons. You can follow them on Twitter and be a Fan on Facebook. *I was not paid for our review. The opinions are 100% mine and may vary from others. I was provided a gift card for my meal from the PR company that represents them.